This is a practical running pouch suitable for all kinds of outdoor sports such as hiking, riding, running, night jogging and traveling. With the headset jack, you can listen to music or picking up the phone without holding the cellphone in your hand, which is quite convenient to use. It’s worth for runners to own. Made from breathable, smooth and lightweight spandex material, comfortable to touch and won’t increase the load. Stores your cellphone, keys, money and credit card, no need to worry about dropping or losing anything. With a headset jack on the front of the pouch, convenient for listening to music and picking up the phone. 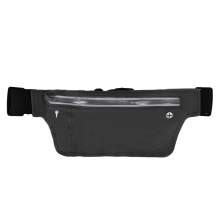 Adjustable waist band fits different waistlines and won’t slip, and the reflective strip will keep you safe at night.